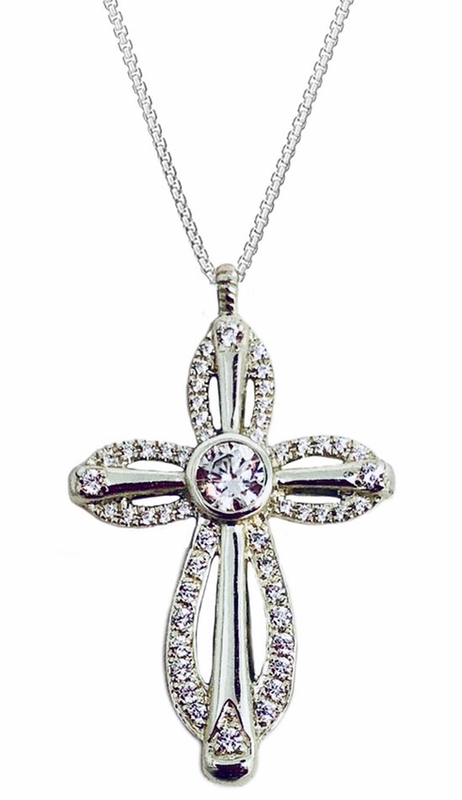 Micro-pave hand setting diamond cut cubic zirconia (CZ) cross pendant for woman and girls, 925 sterling silver. Chain included: sterling silver 925, adjustable from 17" to 18". Comes with a brochure explaining how cross was made and what materials were used. High quality item, very light, it is pleasure wearing it! Mounting of diamonds in pave setting requires great skill and expertise, with lot of patience and perfection required from a craftsman. Pave is pronounced "Par-vay" and originates from the french word literally meaning paved, to best describe the arrangement of diamonds set across the surface. Diamonds are arranged at regular intervals, in a close proximity in a uniform arrangement, building up what appears to be a coating of diamonds, with each stone held within small grains of metal impossible to distinguish with the naked eye. The technique can be used to cover a wide expanse of precious metal. Micro-pave settings are created with the smallest stars (fully cut diamond melee in very small sizes) that are uniform in size and laid out in a honeycomb like arrangement over the surface. How to Pave set Stones? • First small holes are drilled on the cross for placing diamonds. • Then identical-sized tiny diamonds are placed in small holes. • Diamonds are grouped tightly in row so that diamonds covers up as much space of the surface as much possible without overlapping each other, with some breathing space between diamonds. The objective is that the metal should be as little visible as possible, so that just the glittering row of diamonds is evident minus the metal.